Vision Problems, Hearing Issues, Depression, Autism, Spinal Injuries, Bi-Polar & many more! Designed by the Ashtar Command, in conjunction with Medical Assistance Teams, these images represent new potentials within the consciousness field. The delivery of these new, quantum healing matrixes is a united effort to quickly eradicate diseases and health glitches caused by stress, genetic flaws (abnormalities, links) and mass consciousness programming. These multidimensional healing tools are the first of their kind, employing a multitude of spiritual light frequencies to clear health issues and stimulate the body’s natural healing ability. On a basic physical level, the Medical Miracle accelerators provide a focal point which will allow individuals to maintain a permanent, positive visualization throughout their experience. On the unseen levels, the images are complex, biological combination locks, which the body consciousness will easily recognize and use to return the entire system to an optimal state of health. These frequency cures are designed to be utilized by both individuals who are currently dealing with the problem as well as those who feel they may be at risk. Each image will work on a variety of similar problems and will proceed to positively guide your thoughts, emotions and perceptions about what is occurring. 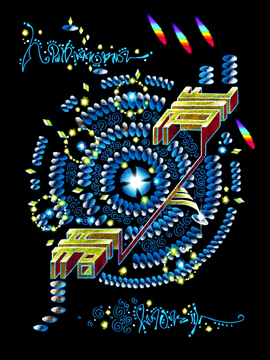 Upon viewing, the images will begin to transmit a series of signals into your cellular structure, which will start to reconfigure the energy and transform even the most stubborn issues even those which may have been present since birth. The images will also disconnect negative genetic links to future inherited/predisposed conditions and problems. Additionally, both medical professionals and holistic healers will greatly benefit from these templates as they are the perfect complement to traditional treatments and proven therapies. 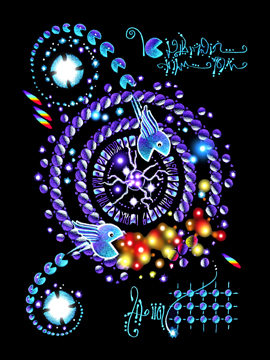 Each of the Medical Miracle templates will require the assistance of the Universal Template #134, which will synchronize the image to your specific vibration. In addition, each template is personally infused with energy by me and my team here at LightQuest. Also, it is important for each and every individual to know that these often traumatic illnesses and problems are transitory “glitches in the system”, and that the more quickly one can visualize and feel themselves healed, the more rapidly it shall be done. As you believe, so shall it be! Special Note: If you are working with the medical templates I always recommend working with a few of the regular accelerator images of your choice as well. This is important because the high-energy accelerator templates work with the underlying issues which you may or may not realize are contributing to your medical “glitch”. CANCER BE GONE – A Spiritual Energy Tool for Dissolving Cancer Cells within the Human Body! Designed by the MAP Teams (Medical Assistance Program) and the Celestial Hierarchy, this 5D cancer healing matrix is the first of its kind, employing a multitude of spiritual healing frequencies through its simplistic imagery. On a basic physical level, the Cancer Be Gone! accelerator provides a focal point which will allow individuals to maintain a permanent, positive visualization throughout their experience. This will, in turn, trigger the dispatch of what are known as ‘cellular angels’ from the 5th dimension of consciousness. When summoned, these ‘angels’ will descend by the hundreds, thousands and often by the millions to gobble up and take away all cancer causing energies within the body. This Cancer Be Gone! matrix is designed to be utilized by both individuals who are currently dealing with the problem and also for those who feel they may be at risk. This image should be focused upon several times daily for the first few days and then once a day when the base energy matrix has been established. To use, one should visualize the ‘cellular angels’ combating the problem or standing guard in and around their body. In addition, one should state the mantra Cancer Be Gone! several times in the morning and in the evening. Also, it is important for each and every individual to know that this often traumatic ordeal is a transitory experience and that the more quickly one can visualize and feel themselves healed, the more rapidly it shall be done! Some individuals will experience immediate and quite dramatic changes within their mind, emotions and physical body. Others may first experience magical, subtle changes, and gradually notice a marked improvement in their condition. Most importantly, it takes a strong Spirit to combat invasive illnesses and energies and harbor a blueprint of divine perfection. As you believe, so shall it be! Most diseases and illnesses here on Earth are caused by mental, physical and emotional stress. Although this may seem shocking to some, there are illnesses that have been created in the shadows and unleashed upon an unknowing public. The delivery systems used to perpetuate control and ‘dark’ scientific discovery are often delivered through 3D electrical, frequency-based mediums such as television, cell phones, computers, etc. Be that as it may, these ‘frequency diseases’ as well as all other health anomalies can be easily reversed through the conscious balancing of your mental and emotional bodies. Important aspects of this balancing process include positive verbal affirmations and a direct connection with God and the Angelic Hierarchy. Summoned by the Angels for this project is the positive global healing magic which was infused into the dual power matrix of Pandora’s Box. Although this magical enigma held the power to destroy; it also contained a high inter-dimensional resurrection technology, much like the Ark of the Covenant, the Excalibur Sword and the Fountain of Youth. To use this image, it is beneficial to visualize yourself parasailing or on a ship with large beautiful sails, setting a course across a beautiful ocean or bay. Feel the cool breeze gently gliding across your face and blowing all around you. You can also visualize yourself in the middle of the forest; watching the leaves fall from the high treetops all around you. Watch closely as the leaves spiral and glide as they make their way through the trees to a new destination. After you have this picture in your mind, gaze at this template and verbally stating the following affirmations. I am free and unencumbered in every way! I am filled with energy and enthusiasm in every moment! Brought through by the Map Teams (Medical Assistance Program), this ‘corrections’ matrix utilizes ‘Rainbow Alchemy’ and the energy of enchanted golden coins to reverse blood sugar abnormalities. This accelerator begins its work by subtly and temporarily rerouting the electrical power structure of the body, recalibrating the flow of energy within and calming the nervous system. Thus, after a time, this recalibration will return the system to its original blueprint operation, allowing the individual’s diet and lifestyle to return to normal. In addition, the alphabetical configuration ‘adreeqj’ is actually a leprechaun alchemical incantation, which was created to further assist in normalizing blood sugar levels within the human body. I now return to the sweet perfection and rainbow light of my original blueprint! Very simply, this memory restoration template will assist in reversing the mental, physical, emotional and spiritual degeneration process that is manifest through the Alzheimer’s experience. This image, designed by our interplanetary neighbors from Andromeda, will gradually piece back together any fragmented memory storage units within the hemispheres of the brain and emotional body. This accelerator will also enhance brain capacity/IQ beyond all known limits. This fragmenting is most often caused by mental stress, accumulated either through the over-processing of thought forms and/or a stubbornness and often refusal to acknowledge things as they are. But have no fear, those who have fallen helpless to the Alzheimer’s experience can now begin reclaiming aspects of themselves, their thoughts and joyful feelings of decades past and move forward into the bright future. To best integrate this image, visualize the blue wheels turning and the block/cube-like structure moving back and forth across the design, re-patterning, recalibrating and regenerating the memory banks. In addition, state the following affirmation to enhance the alchemical, magical transformation occurring within you. 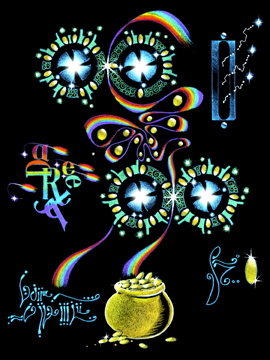 Brought forth by the Legions of Light for this alchemical accelerator was none other than the biblical “Staff of Life”. 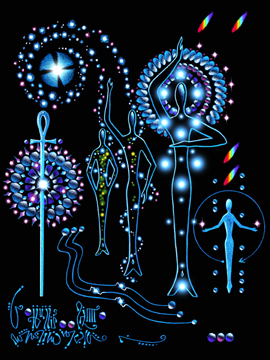 In ancient times this Staff carried the power to transform, transmute and transfigure all energies and physical matter in every dimension of existence. Therefore, with such a complex, stubborn virus such as HIV/AIDS, we must call on that former power, the Staff of Life, to resurrect and reinstitute the paramagnetic and all-powerful “Tree of Life” within the physical body. This image is very straightforward in that it shows a transforming human system, at first plagued by illness, then magically transformed and reborn anew. The tallest figure in this image shows the fully regenerated immune system and the recalibrated Sefirot/Tree of Life around and within the body. To utilize the power and energy which is contained in this image, simply look at it a few times a day, visualizing the Staff of Life within you, resurrecting the Sefirot/Tree of Life and regenerating your immune system. Feel the electrical, spiritual power of your seven-point chakratic system reconnecting, regenerating and renewing your mental, physical, emotional and spiritual health. Know absolutely, that you are being transformed through the Divine love and power of God and the Legions of Light. Enhance the power of your vision and emotions by verbally stating the following affirmations several times a day. I am a being of Violet Fire, I am the purity that God desires! I am the resurrection and the life, I am the ascension into the light! MAGIC MIRROR, SHAPE-SHIFT ME INTO PERFECTION! This template utilizes the ancient Magic Mirror/Looking Glass portal technology, which will clear all mental and emotional ‘body image’ misinterpretations and distortions from the human energy field. Very simply, this accelerator is a spiritual energy cure for Anorexia, Bulimia and other ‘desecration of the body temple’ illnesses which distort the original, divine human form. It will begin by ridding the body of any foreign energies and/or entities which are causing the distortion, as well as ‘force’ the blending of any lower immature/negative aspects of Self attempting to control the vehicle for various reasons. The image will continue its work by forming an alliance with the Higher Self to set up a new energy field which will prevent the individual from absorbing distortional body image programming from the media (i.e., magazines, books, television and other external sources of information). This matrix can also be used by individuals who have excessive tattooing, piercing or dangerous ‘warrior’ tendencies (i.e., making frequent, conscious choices to subject the body to danger, physical pain or harm in any way). To use this image, simply visualize yourself within the Magical Mirror and ask the Holy Spirit to descend within and around you, transforming your thoughts, emotions and body into the perfect vessel of light. In addition, state the following decrees three times in the morning and evening to accelerate the internal transformation. I am the light of my own salvation! I hold the keys to renewal and perfection through my own individual beauty! Promoting Beautiful Smiles and Dental Perfection! This image was created by and is connected to all of the God-sanctioned MAP (Medical Assistance Program) Teams (Galactic, Angelic, Ascended and Elemental) which are assisting the humans on Earth at this time. These teams can be called forth by name to help heal all manner of physical, mental and emotional issues at this time. Specifically, this image promotes the resolution of all physical and energetic issues regarding the teeth, the gums and the entire jaw area. 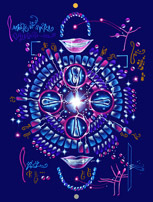 In addition, within the Happy Teeth image matrix are many levels of healing energy which will help balance your spiritual, mental and emotional perceptions and unconscious issues regarding all imbalances in the mouth area. Initially, when I asked the MAP Teams how to best utilize the energy in this image, they said, without hesitation, “Eat it!” Upon asking for further explanation, they stated that this image’s healing energies are best assimilated and integrated by holding the accelerator in front of you, and with your mouth engaged in a chewing motion, simply eat all of the designs imagery energetically. Now this may sound a bit strange to some newcomers, however it is abstract simple methods like these that are often the most effective. #250 – Addictions Cure: Prescription & Illegal Drug Dependency, Alcoholism, Smoking, Compulsive Shopping, etc. #254 – Asthma, Allergies & Respiratory Cure: Bronchitis, Pneumonia, Coughing, Wheezing, Lung Problems, etc. #236 – Blood Disorders Cure: Leukemia, Anemia, Hemophilia, Blood Clots, Iron Deficiency, etc. #135 – Cancer Cure: Breast, Lung, Pancreatic, Prostate, Colon, Bladder, Mouth & Throat, Skin, Leukemia, etc. #252 – Depression Cure: Related to Grief, Abandonment, Self-Worth, etc. #245 – Digestive Disorders Cure: Includes problems relating to the Esophagus, Colon, Intestines, Intestinal Flora, etc. #271 – Endocrine System: Includes: Pituitary, Thyroid, Adrenal, Pineal, Pancreas, etc. 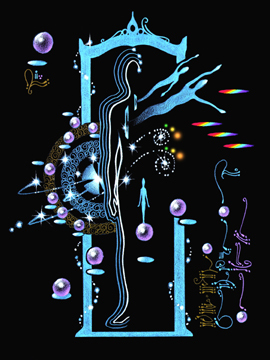 #296 – Energetic Acupuncture – Designed by the Ashtar Command, in conjunction with Medical Assistance Teams, this image works through the body’s meridian system to energetically pinpoint and correct imbalances, while stimulating the flow of chi through the body. Energetic Acupuncture is a perfect complement to use with all other medical miracle templates and is recommended especially if there is stress present and/or one’s energy tends to fluctuate up and down quite a bit during the course of a day. #137 – Female Organs & Fertility Issues Cure: PMS, Hot Flashes, Endometriosis, etc. #267 – Foot Issues: Includes: Corns, Calluses, Ingrown Toenail, Achilles Tendinitis, Bunions, Gout, Flat Feet/Fallen Arches, etc. #140 – Headaches & Head Trauma Cure: Migraine, Concussion, Head Trauma, etc. #255 – Hearing Impairment Cure: Tinnitus, Deafness, etc. #248 – Heart Problems Cure: Arrhythmia (Heart Palpitations), Coronary Artery Disease, Hyper Tension (High Blood Pressure), etc. The Universal Template is to be used in conjunction with each Medical image! #246 – Mental Disorders Cure: Anxiety Disorder, Bulimia, Anorexia Nervosa, Body Dysmorphic, Dementia, Narcissistic Personality, etc. #265 – Nervous System: Includes: Epilepsy, Seizures, Bell’s Palsy, Brain Aneurysm, etc. Special Note: Disorders such as Parkinson’s & Huntington’s Disease, etc. are considered both neurological & muscular in nature. For these and other disorders both the muscular & nervous system templates are needed. #260 – Obsessive-Compulsive Disorder Cure: Hoarding, Anxiety and Panic Disorder, etc. #251 – Phobias Cure: Arachnophobia (spiders), Social Phobia, Aerophobia (flying), Agoraphobia, Claustrophobia, Acrophobia (heights), etc. #259 – Skin Conditions Cure: Acne, Rosacea, Psoriasis, Eczema, Hives, etc. #235 – Sleep Disorders Cure: Sleep Apnea, Insomnia, Sleep Walking, Narcolepsy, Sleep Paralysis, etc. #239 – Spine Injuries & Diseases Cure: Whiplash, Kyphosis, Herniated Disc, Scoliosis, etc. #258 – Teeth and Gums Cure: Gingivitis, Periodontitis, Sensitive Teeth, etc. #253 – Vision Problems Cure: Near-Sightedness, Far-Sightedness, Macular Degeneration, Glaucoma, Blindness, Blurriness, Cataracts, etc. The entire Medical Miracle collection is available at a special price of $365, plus shipping for all who would like to integrate this entirely new and ground-breaking energy field! You can also purchase the full collection in two separate packages if you prefer. The templates are a wonderful gift to humanity at this time and are beneficial to give as gifts to family members and friends, including children and teenagers. While you can openly give these to those who are familiar with multidimensional energy, when giving to others you may want to follow the simple guidelines below. 1) Present them casually in a relaxed, natural and caring way. Do not be pushy or give information unless asked, as this will prevent the person from properly connecting with the templates. Be aware that many individuals do not necessarily need to read the information and instructions; all they need to do is view the image frequently. 3) A Universal Template is needed for each individual using one or more Medical Miracle accelerators. The Universal Templates should not be shared. Medical Miracle Questions & Answers! 1) How do you work with the Medical Miracle templates? Basically, you need to sit quietly and focus your consciousness on the template by holding and looking at it. Consciously make an effort to interact with it. Remember, these templates are a living consciousness and do require small amounts of focused attention from the individual who desires their assistance. Also during this time you can use verbal affirmations to enhance the process. Work with one template at a time for a week for a few minutes or more per day. At that point, you can then can add in another template if you so choose. This gives the body a chance to integrate and start shifting one issue at a time. 2) How long do people need to use them before they notice changes? It is important to know that the templates start working immediately upon connection with the individual, however everyone’s healing journey will differ, some may be healed overnight while others will take time according to how long they have had the particular issue. You should notice subtle thought-form and emotional changes regarding the issue within a week; noticing some detachment and less of a focus on the illness and more incoming positive thought-forms. Once again, healing time will differ with each individual, depending upon one’s level of connection with the templates, the severity and duration of the condition. Stay patient, focused and inspired! 3) How does the Universal Template work and does each individual using the Medical Miracle templates need one? The Universal Template helps to calibrate the Medical Miracle templates to an individual’s unique, personal blueprint while syncing it to their current thought forms and emotions. Every individual working with a Medical Miracle Template or a group of templates needs to work with a Universal Template at all times. You can use the same Universal Template with every other template that you are using. But, if you are gifting a template to someone, each individual you are gifting must receive their own Universal Template. 4) What if there is an issue that falls into more than one category, for example bone cancer? If someone has bone cancer they would use both the Bone Diseases and Cancer Templates along with the Universal Template. 5) Can people who are experiencing the same issue share the templates? 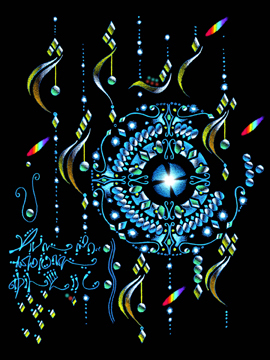 The energy is cleaner and much more precise if it is directed toward one specific individual. So while it is ok to share, it is not necessarily recommended.